2018 had been an odd summer for me as spring had been totally centered around the Double Ramsay Round which I attempted on June 29th weekend. I completed the Double after 55.56 hours of extremely hot weather. Now because I hadn't achieved what I wanted to achieve - ie a sub 48 hour round I found it hard to come to terms with what I had achieved. After the round I also didn't feel very tired but had not put any structure to my recovery and training between the Ramsay and the UTMR so although I was running fine and doing the odd race I felt slightly in limbo as I knew to actually "train" would be counterproductive and probably wear me out more than it would improve me. As July and August progressed I focussed more and more on the Ultra Tour Monta Rosa. Having pulled out at midnight in 2017 at mile 60 with a chest infection I wanted to complete this year. I do not "dnf" (did not finish) frequently; in fact there was only one other occasion about 10 years ago at the Tankies Trog when a cyst had burst in my ovary giving me a lot of pain. So I also found it hard to come to terms with this. I got all my kit and food ready well in advance as I was also spending the week before the UTMR in Chamonix crewing for Damian Hall in the Ultra Tour Mont Blanc so had two lots of packing to do! 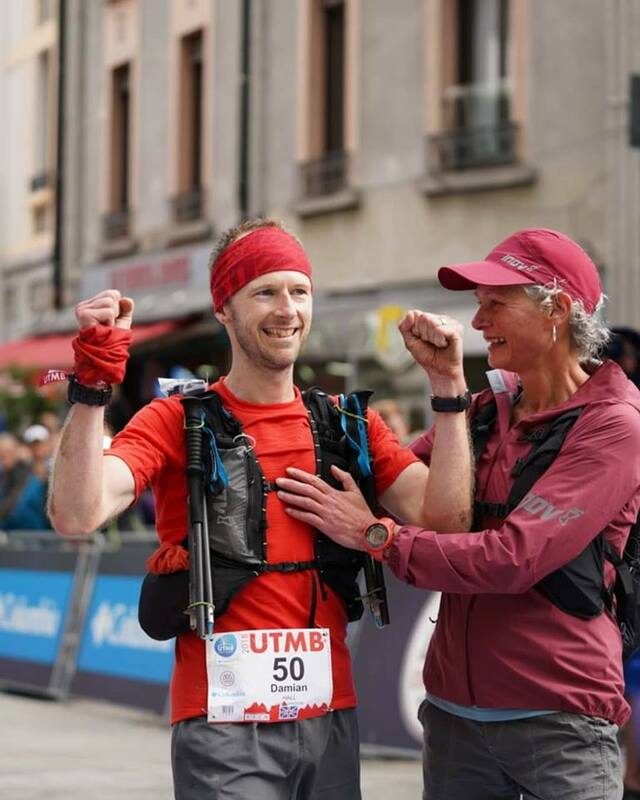 The UTMB week went very well. I spent the days on the Inov-8 stand and the evenings I made sure I was in bed by 10.30pm as I was very worried about catching another cold like in 2017. We had to lose one night's sleep when crewing for Damian but it was well worth it to see him through all the checkpoints and help him to realize his dream of a Top 10 position but even better he finished 5th! Watching him finish made me cry as I knew how much it meant to him. I also saw a very good friend Beth Pascal finish 4th Lady and again it was very emotional as she had dnf'd in 2017 and come back to put it right. I knew it meant a lot to her to finish, but also to finish well. On Monday 3rd September it was time to say goodbye to the Inov-8 crew; Michael, Adrian and Lee at Geneva airport and collect my own hire car to head to Grachen. I was nervous of driving the car but also now, there was no distraction from what was coming next. I only had three days and I would be racing the UTMR starting Thursday morning at 4am. Once out of Geneva and on the motorway the pressure I put on myself built up until in the end I decided, just to let myself have a good cry. It helps sometimes just to let it all out - whatever it is. I don't cry very often so when I want to I usually find it works. And it did. I pulled myself round and arrived at Grachen ready to sort Parking, shopping and accommodation out. This all went very easily and I was lucky enough to get a small room all to myself at the very top of the chalet. The only downside was I got out of breath even climbing five flights of stairs! I let Lizzie know I had arrived and she came back with a request. "Would I be ok to mark out the 10k of Taschalp to Zermatt section?" It wasn't exactly what I had planned but I know how hard Richard and Lizzie work and looking on the map I could drive to Taschalp and it was only 500m climb so I agreed. I collected all the flags and markers on Tuesday morning and set off. Thank heaven for Sat nav and Google maps to get me through some tiny streets and up to Taschalp. I set off one way for 2km and back to the car for lunch. Then at 2pm I set off to Zermatt. It was a pleasant way to spend the afternoon but I was worried how late I'd be coming back. Plus I had this horrid niggle in my right glute and a pain down my quad. I had had it since getting cramp in the Borrowdale race and hoped that not running would have made it go away. But obviously not. By the time I finished at 7pm it was very bad especially driving back to Grachen. I did loads of stretches and rollered everywhere. "Oh well" I thought "Maybe I'll just have to set off and see". At least I slept well having had a full day out in the mountains. Wednesday was spent sorting my kit, head torch's and food out for the four dropbags - Zermatt, Gressonay, Alagna and Macugnaga. As the weather looked ok with the risk of some showers and a little cold I decided to set off in my Inov-8 short sleeve half zip base layer with my black Enso skirt . I had all the required kit using the Stormshell as my waterproof as rain was expected and it gives me more protection than the UltraShell. I did put in the Ultrapants as my bottoms and also planned to set off in the Windshell as at 4am I thought it would be a little chilly. I managed to get all my food and kit into the new version of this pack All Terrain Pro Vest although it was a bit of a squash. I had been planning to wear the Trailroc 285's because I wore them in 2017 but having worn them all day Tuesday they just didn't feel right and so I decided on the Trailtalon and put the TrailRocs in my dropbags. Last year in my notes I had put "Need an extra warm layer plus hat and gloves in each dropbag". This was because I got cold whenever we climbed to altitude (which is often) and also overnight. So in each drop bag I put either a Softshell Pro Jacket or the Thermoshell . Onto head torch's. I usually have a "cunning plan" which is to set off with two light weight headtorch's and batteries, then overnight exchange one for a brighter torch and longer lasting batteries. So this year the plan was to carry a tiny Petzl and use the Silva Explore 3 which packs a lot of light for 3AAA batteries. Then I was going to collect my Silva Trail Speed 3xt and a big battery from Gressonay. 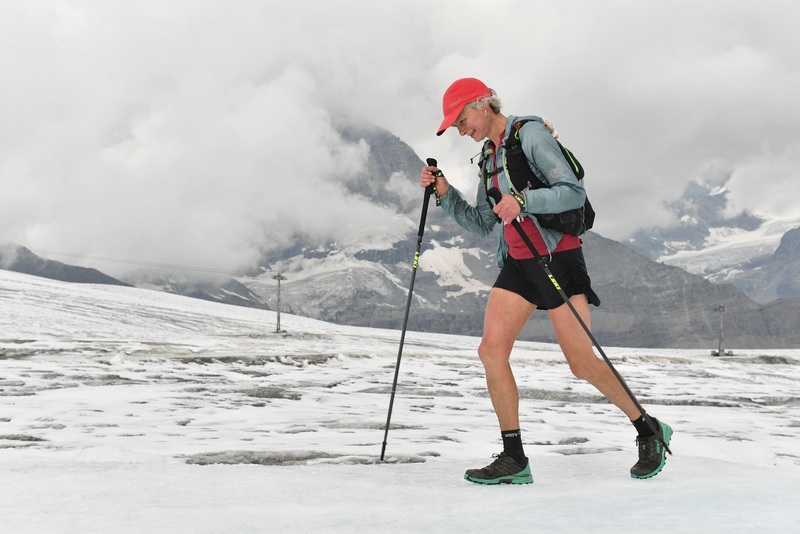 For poles I always use them from the start of the race and because I knew the UTMR was rocky I wanted a strong pair that might survive the terrain. 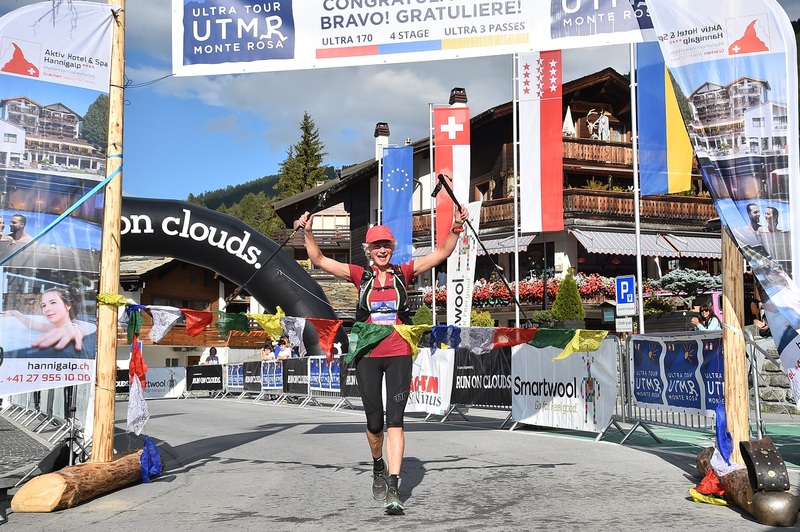 I chose the Leki Micro RCM as although I had used the Leki Micro Trail I wanted a lighter pair of poles plus with wearing gloves and mitts I thought the strap option would be easier to cope with especially overnight and when I was tired. I really like the molded foam grip too which fits your hand so that when descending etc it's easy to hold the pole. Right - so after packing I went to Register which is so quick as there are only 300 entrants and it's a well organised system they have. Then I was left to eat more pasta, talk to the other hostel runners and settle down to an early night at 9pm. The town is so quiet at 9pm that's it was easy to sleep and I felt ready at 3am to begin the race. The Start is so relaxed and it's possible to nip to the loo and still be in place by 3.55am. There was a short rendition by local horn players and Lizzie says "Go". I was determined to set off slowly and not get caught up in racing early on. The pace felt easy and we were soon off the road and onto trails. I kept comparing it to how I felt last year when it felt frenzied and the pace felt fast. There was a diversion round a rock fall to the first CP which meant we dropped down to the valley and then ran along the road for 1km. Suddenly head torch's were coming towards us. This isn't the right way they said. It's a dead end. Lizzie appeared and started running back the way we came. We all huddled around her, keen to get going, but not keen to get lost! We had missed the bridge and all piled over it, rejoining the race about 50 runners further back than we had been! It was very annoying but then again too early on to try and race back into a position. I was passing people I knew like Carrie Gibson and Emma Williams so it was nice to chat to them again. I ran with Pip Haylett for a while as I think we both needed some nice company and a chat to while away the long valley roads and tracks. The first climb came and was a welcome relief from the faster running pace. We were still behind our original positions but I tried to be patient as the path was too narrow to pass and I was determined not to overdo it early on. The 1st CP was now an out and back so it we saw the leading men and women. I was maybe about 5th. Again I just thought it too early to worry about. One of the race's worse bits was coming up and it would ne nice to be over that. I have this dislike for suspension bridges - I used to skydive so it's not heights or exposure that concerns me. I just don't like the "ground" moving under my feet. And this bridge; The-Charles-Kuonen-Suspension-Bridge is one of the World's longest! I shouted at a runner in front who was running! "No Running, Walking only!" and then kept my eyes on his feet as we swayed our way across it. Whew I was glad to get off. I've got to finish then I don't have to cross that thing ever again! Running across to Taschalp I was looking for the path I would recognise from marking up. I soon saw it and then the CP. I still had food but took some coke. I knew the next section was runnable and just wanted to go along at a steady consistent speed. It was nice running the route I knew and down into Zermatt. I dived into my dropbag conscious that my next drop bag wouldn't be for another 8 hours at least. I collected a rice pudding, fruit salad and noodles, to which I added hot water and I was off. I had seen the 2nd Lady and hoped I could catch her soon without too much effort. This next climb was a big one and the first to altitude of over 2300m. Last year this was when I first started puffing and so I was conscious of this. It was a little warm to start with, zig zagging up but I could see clouds and hoped the rain forecast for 4pm would come. I passed Gandeghutte at 1pm and they said it was cold on the glacier. I said I hoped so! Soon after I spotted the 1st Lady trying hard however when we got onto the rocks (much like Carn Mor Dearg in the Scottish Highlands) I caught her easily. My shoes were gripping well and gave me confidence to cross the rocks with ease. Once on the slushy snow of the glacier though, I had to adopt a strange slither in order to retain some forward movement. Unlike 2017 there were no stunning views of the Matterhorn behind me! But I was happy as I was feeling relaxed and breathing easily unlike 2017. I knew which scenario I preferred. Onwards to the top where it did get cold so I put my waterproof on as well. I knew that we then dropped quickly onto runnable tracks so I just kept going and said sorry to my cold hands. Over the pass and onto the huge expanse of summit tracks and moraine where I descended quickly but I tried to stay relaxed as I knew that this was a long descent. Now at 3316m we were heading down to Refugio Ferraro at 2856m but then all the way to Gressonay at 1650m. It started to rain properly but I was warm and descending so the hands soon warmed up. Running through into Rifugio Ferraro I asked for a warm drink to put in my water flask and got tea. The lady was very friendly and told me it was to rain till 8pm then be clear till 11pm and start again. This was good to know. It was now 4pm and I had a long descent ahead. I left and ran on. Everything was becoming so much better than 2017. I felt good, my legs were working. I had eaten most of the noodles and the rice pudding. After Gressonay I knew there was another long climb and descent then I would be at Alagna where I dropped out last year. I headed down the very long windy paths to Gressonay sorting out in my head what I needed from my drop bag. The Checkpoint was inside this year which was nice in the rain. I got my dropbag and sorted my food out. I was going to take more noodles, put a Taylors coffee bag in my water bottle and get two rice puddings. I then reached inside for my head torch. And couldn't find it. Looking into the bag I realised that my spare shoes were there and they were supposed to be in the Zermatt bag. The realization of what I had done was awful. I had no big head torch. All I could do was change the batteries in the Silva Explore 3 and hope that I had put a head torch and battery in the Alagna bag - otherwise I would be spending a rather awful 8 hours on low light from Alagna. I did this cursing my stupidity and also hoping that somehow I hadn't put all the head torch's in the wrong bag and there was nothing at Alagna. But I couldn't do anything about it till I got there in 5 hours time and found out. I put on my 3/4's and my Softshell Pro Jacket from the bag and collected my mitts as last year it was very cold and snowing at the top of Passo del Salati. One thing I did want to do was get as far as I could up the next huge climb in daylight, especially as we had got lost on this climb last year as it was a minefield of tracks and paths to the top which is at least a warm, well lit ski station refuge at 3026m. So I set off quickly and moved well in the daylight. It was still raining and it was soaking through all my clothes now - even to my knickers. I caught two runners up and one headed off in front of me which was good because he was finding the way! I remembered a lot of it from 2017 but was glad when the skies cleared and we could see the lights of the ski station. Using my head torch now I followed the markers and the chap in front, right up to the ski station. I didn't need to stop and was hoping he would carry straight on as it was also hard to find our way off last year, although it had been claggy. But "No" he had decided he needed a sleep. So after a minute and a coffee refill I set off down, knowing it was a long, long descent to Alagna (and to a new head torch or not!). I spent a lot of time cursing about the head torch and hoping that my drop bag contained my spare. I found the way down easily and was soon running down the road to Alagna. In the door and straight to my drop bag. Opening it I found the clothes bag and in the clothes bag - Yes a spare good head torch!! the Magicshine MJ 858 and a battery that should last me 6 hours. Whew!! The lovely checkpoint staff were fussing round. Did I want food? Drinks? Sleep? No I was being self sufficient with my noodles which were messy but the system was working. I put them in a Pour and Store bag, added the sachets of spicy stuff and a little hot water, closed them up and took them with me. Out on the trail I could grab mouthfuls at a time and add water as needed. Along with two rice puddings and about 6 gels per leg that was me sorted. I didn't fancy my bars nor baked beans and it was too cold for fruit salads now. I put a fresh coffee bag in one water bottle, added the hot water and I was good to go! Giving the checkpoint staff a big hug, as I had spent over 12 hours with them last year, I happily trotted off down the road to a new adventure! I had heard that this next climb "went on a bit" and that was true. The valley wasn't bad as I could run it but when we arrived at the climb it was an incredible feat of manmade building which reminded me of the track upto Snowdon. There were thousands of zigzags all with a drystone retaining wall holding the cart track road up. Along each side of the track were laid huge flat stones and it seemed easier to walk along these however 1 slab in 100 were lethal and slippery. We wound our way up from 1575m to eventually reach the col at 2775m. I had been slowly catching someone and he had stopped at the col to change his socks. An odd place to change your socks so I headed off down. The route down started off just the same; lots and lots of zigzags. Some nice slabs and others lethal. It's going to be a long descent! After 600m we left the track and went off on an extremely slippery path. There was no running this - the stones were wet and water was running down the path. Walking along made a nice change actually and I thought that if anyone could run this then hats off to them! It was weird though as I was sure I could hear tip tapping of poles but couldn't see any head torch light. On and on and on until eventually a little tent appeared. They didn't have any food so I filled up my water but the lady said "Oh it's just 30 minutes to Macugnaga" so I ran off quite happy and looking forward to that. And I ran, and ran and saw a town and a building all lit up and thought I was there. But No, up this track (and it was "up" as in uphill!) the flags sent me. It seemed to go for hours - much more than 30 minutes that's for sure! Eventually I was running down and saw the sign Checkpoint 500m - and by this stage I knew that also meant (or maybe just felt like) it was more like 800m. But I was there - another dropbag. My last drop bag. I was brought some vegetable soup but again I was just getting my noodles and rice puddings ready to go. I did change my socks although my feet felt fine. They like being cold and wet. I also had not felt my injury / niggle so all in all things were good. And it was getting light as it was now 6am. I was looking forward to seeing the statue of the Golden Madonna at the top of Monte Moro but it looked like it might be in cloud as when I climbed I couldn't even see the ski station. This was a better climb as it was steeper and I gained height easily. My breathing was still good until about 2500m where I got out of breath. But I felt strong. Reaching the ski station I was ushered inside. Oh it was nice! Warm and cosy with lots of nice food and very welcoming The sponsor On-Running were manning the Checkpoint and were making it a wonderful surprise. But I wanted to get on so just spent a few minutes there and resisted the Apple Strudel (although it is my favourite) as I wasn't sure my stomach would cope with it! The marshalls pointed me up into the mist. Apparently the Golden Madonna was just 100m up the rocks. Climbing the strange wooden plinths I was glad to reach the top and there she was. I'm not one to be impressed at things on mountains - but towering over me in all her elegance she looked serene and I was very glad I had the opportunity to be there. I took a couple of minutes to reflect and then "Lets go!". Down I went, having to trust the rock as the markers pointed the route straight over them. I found them to be grippy - like Peak District millstone grit which was very nice! Reaching the plateau an American lady hollered from inside her tent "Way to go Lady" "Go get them!!" Running down I was feeling good .... and then I saw the lake! I'd forgotten about the lake - or rather the 5km track along the lake, followed by a road / track descent into Saas Fee. Oh well nothing for it but to take off a few layers and get on with it. I'd been running with a couple of guys and together we pulled each other along. The road was painful though on tired legs and bruised toes. It was like the descent to Macugnaga. There was descent but then a gradual uphill track that was just too much of a gradient to run but went on forever. I walked fast, using the poles and thinking of how long to the Finish! It was now midday and my 37.30 hour schedule had been very accurate to now. That meant I would finish at 5.30pm. Another five hours at least. I had gone off most of my food. I added more hot water to the noodles and got on my way through the town. Confusingly I seemed to overtake a couple of guys but be overtaken too. I got worried in case the 2nd Lady was catching me. 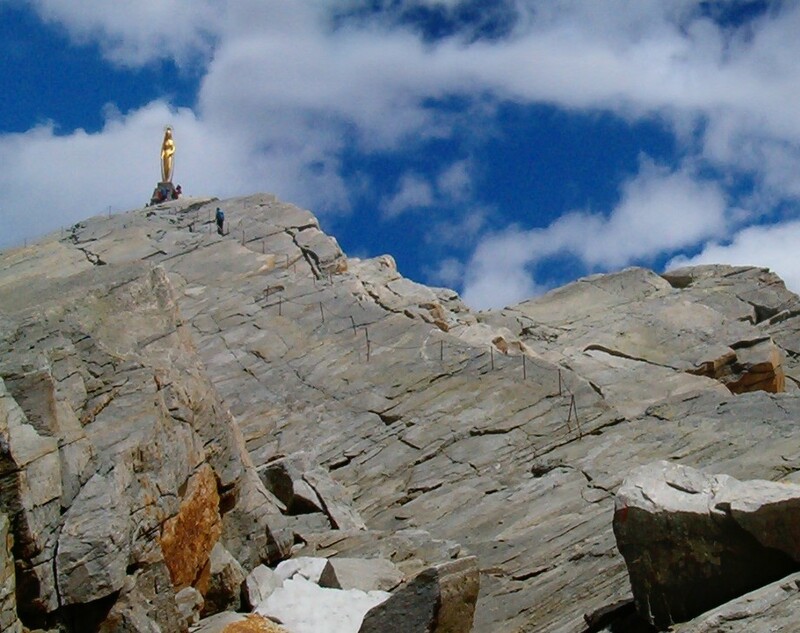 We climbed and I felt ok then we reached the contouring path that would lead us to Hannigalp. Charmian had warned me about this thing - that it went on forever and if I could it would be good to recce it. But I hadn't - how bad could it be?! Well it wasn't the terrain that was bad - but it was just so slow and went on forever. A tiny sheep trod type path that contoured, with climbs and descents the way round the hillside. A ranger coming the other way said I would take 2 hours to Hannigalp. But after 3 hours I decided that the Swiss have no idea of time! I had started to count and curse the number of false hillsides I wound myself round. But never mind I couldn't see anyone behind me and the chap in front of me (one whole hillside wiggle ahead) wasn't getting away from me either. "It's impossible to move fast on this; she can't be catching me". 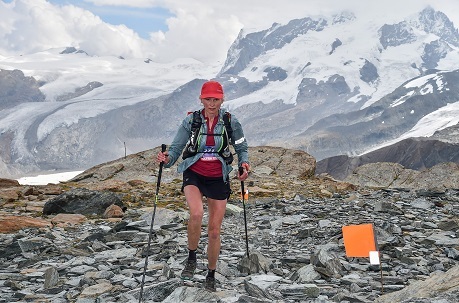 So after 5 hours (my schedule was right) I reached Hannigalp and they said there was no 2nd Lady behind me for at least an hour! So now I could enjoy the toe numbing pain of the last descent and look forward to crossing the line! 1st lady and somewhere like 7th I had been told. I got ready to enjoy the Finish. This is what I had been dreaming of and waiting for .... for a whole year. There was a Finish line set up for me to break and I ran through with my arms up. It was great! Lizzie came across and put the silk scarf round my neck along with my medal. She handed me a beer and my Swiss pen knife memento. Absolutely fantastic! I look back and think it was one of those dream races where everything goes right. There were things that could have been better like the head torch fiasco but overall it was all great. 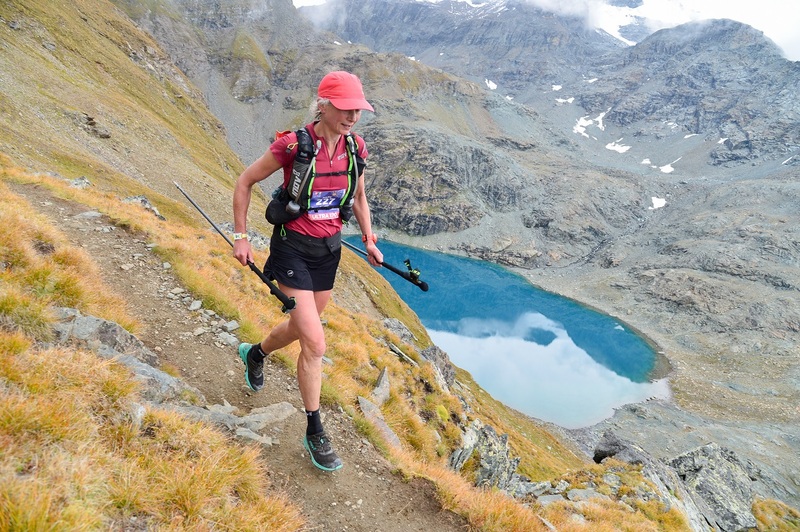 The Ultra Tour Monta Rosa is a classic ultra race; much like a classic fell race. 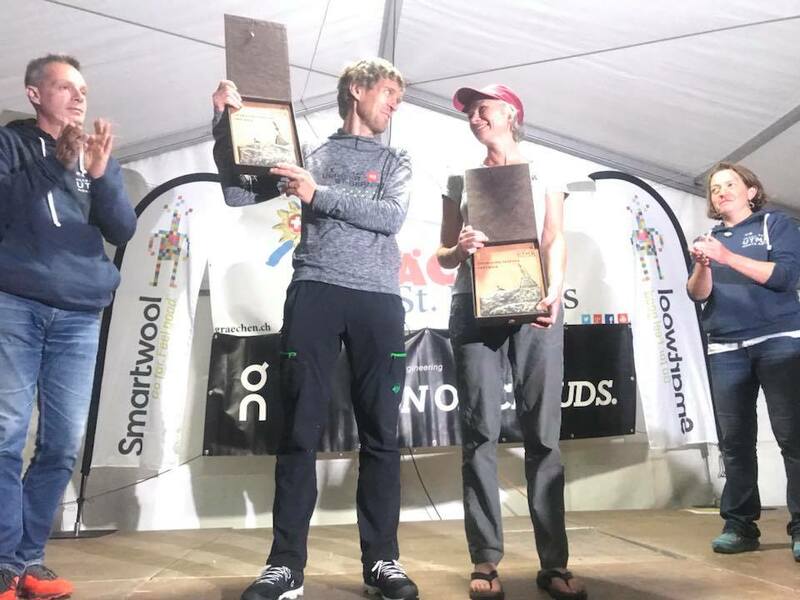 Lizzie and Richard put so much thought and work into the whole organisation and the result is a race where you feel nothing has been left to chance. The route is very hard, the logistics are harder. 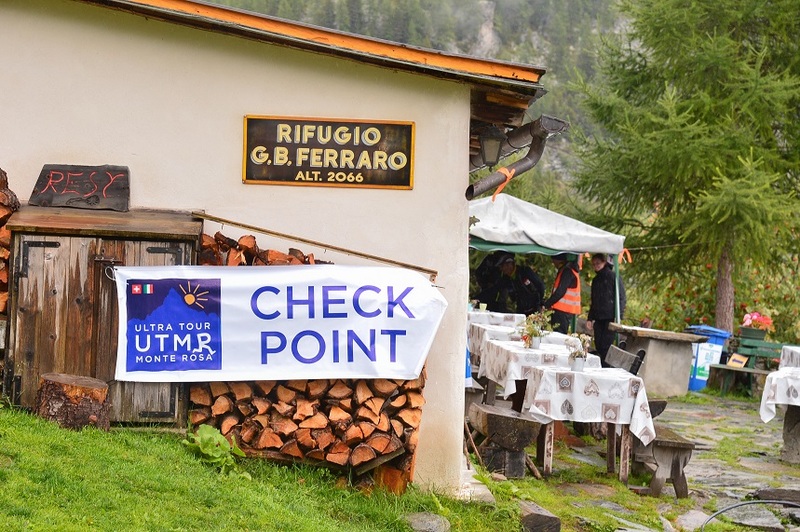 The checkpoints staffed by volunteers and the whole feel of the race is of a very small, very friendly, very hard working community. I hope that the UTMR grows into a race that is sustainable and worthy of Lizzie and Richard's efforts, because it so deserves to.